Millions of investors and everyday Americans have discovered Shake Shack’s high-end hamburgers. They taste great, and the new chain is a snazzy place to hang out. Nonsense – sure both stocks are volatile, but TSLA investors can be glad the similarities stop there. Recent investing history has been very clear about the ultimate fates for companies like Shake Shack – and investors should pay attention. There are undeniable parallels between Shake Shack and another infamous stock story in investing circles. Here’s why investors would be wise to avoid Wall Street’s new darling. They say those who fail to understand history are doomed to repeat it. I don’t disagree. The markets display a tremendous propensity for cycles and patterns. Not surprisingly, many investors focus on what’s worked in the past, logically expecting it to work in the future. That’s okay if you have the ability to incorporate change in your routine like a trader and the strict risk management discipline to go with it. Unfortunately, most investors don’t. So they keep doing the same thing over and over yet expect different results. This makes no sense whatsoever, especially when you have glaring examples of prior market action staring you in the face under very similar circumstances. 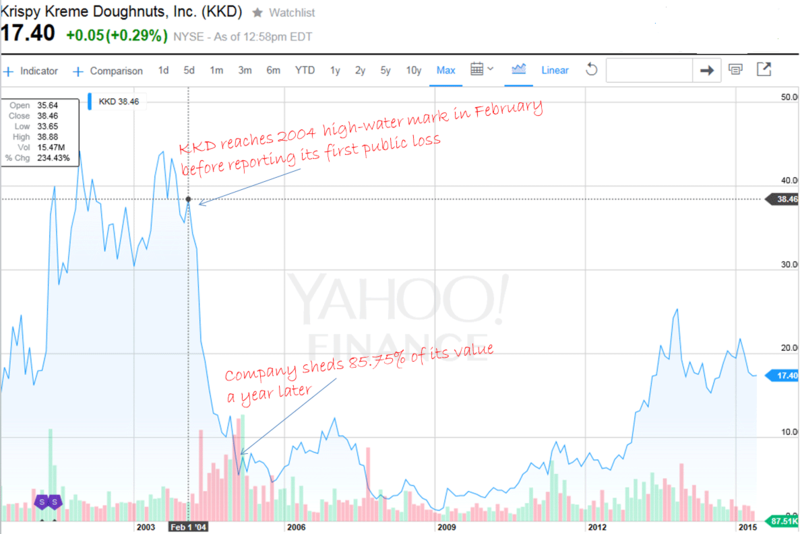 Take Krispy Kreme Donuts Inc. (NYSE:KKD), for example. 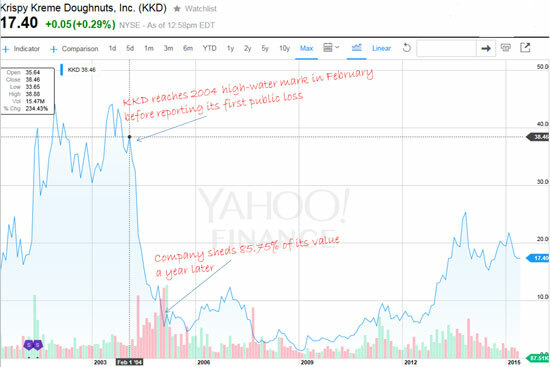 The much-loved donut chain IPOed on April 5, 2000 at $21 a share. Just over a year later it jumped to the New York Stock Exchange on May 17, 2001. By 2003 the company’s stock had reached an all-time high of nearly $50 a share. In 2004 it reported sales of $665.6 million generated by nearly 400 stores and profits of $94.7 million. Analysts were falling all over themselves to recommend Krispy Kreme. I recall the trading community abuzz with glowing language used to describe the company. Phrases like, “rapid expansion and solid fundamentals,” “growing customer loyalty,” “steadily increasing earnings,” and “unrealized potential” all made the rounds. It was too rich for my blood. I remember thinking at the time that there was no way people would eat enough donuts to support the stock’s lofty valuations. By February 2005, the stock had lost 85% of its value following missed estimates and the company’s first public losses in May 2004. Today it still trades at only 39% of its peak. Source: Yahoo! FinanceAt the time of the meltdown, CEO Scott Livengood offered the almost-plausible explanation that millions of Americans following the high-protein Atkins diet had elected not to eat his company’s products. “Killed the market” would have been a more accurate description, considering the company announced a turnaround plan intended to avoid bankruptcy not long after. In reality, Krispy Kreme did what many newly cash-flush IPO companies do: pursued growth at any cost. The reasoning was that customers would inevitably follow growth. So would investors hoping to cash in on a quick buck. You know like I do that there’s no such thing as a “free lunch” – pun absolutely intended. Anything new goes through a honeymoon period. From shoes to hamburgers, the public loves to try new stuff. It’s the American Way. Krispy Kreme was no different, but that didn’t make it a great investment then any more than Shake Shack is today. Novelty wears off. Management actually has to prove it understands how to run a business, not just make fantastic donuts using a fabulous recipe. Neither Dunkin Donuts nor McDonald’s experienced the “Atkins effect,” in case you’re wondering. And that brings me full circle… how do you know if Shake Shack is going to be a repeat of Krispy Kreme? First, take a look at the chart. Obviously, there are some similarities. Despite the fact that the two IPOs are years apart, you can clearly see the unbridled enthusiasm reflected in how fast prices rose and are rising, especially if you look at the first 250 days of trading. More often than not, what goes up that fast… well, you can finish that sentence. Krispy Kreme was based on a super recipe and a lot of corporate mumbo jumbo, not to mention pre-IPO profitability that, by all accounts, had been great. They still make great donuts. My point, though, is that prices reflected a lovefest made all that much sweeter by its products. Much of the Shake Shack mystique centers on something similar. Only this time around it’s the cult of management and a team with the “personality to please.” The concept of “Enlightened Hospitality” plays heavily, too. By this management means caring for customers, employees, suppliers and each other. But the dead giveaway is that management believes in training for qualities that “cannot be taught.” Look at the website and you’ll see what I mean very quickly. If Shake Shack were a tech company, you’d be hearing about how the company “resonates” with customers or provides a “solutions focused product” and something that’s “solomo,” which is how techno-obsessed Silicon Valley types describe any business that is social, local, and mobile. My point is that any time a company has to resort to intangibles, you ought to immediately look deeper to see what’s real. Then, as now, there’s plenty of buzzword speak and social positioning that makes me wonder if management really understands where it’s going. And, third, take a good hard look at the numbers. Shake Shack just reported its first full quarter with an earnings beat and raised guidance. The stock price soared. Revenue rose 56.3% while EPS doubled. And the stock is now trading at around $89.95, more than 4x the $21 per share IPO. That sounds great, but let’s put those numbers in perspective. We’re talking about a company that just earned $0.04 a share on revenue of $37.8 million. The company wants to expand to a mere 400 locations. Call me crazy but is SHAK really worth $3.25 billion under the circumstances? Right now Shack Shake’s PE Ratio is a staggering 1,285. By comparison, the S&P 500 Index carries an average PE ratio of 15.54 right now, and that’s considered expensive by most professionals. The Tech Bubble crashed at a PE of 26.6. I realize that’s tough to wrap your mind around in today’s media addled world, so let me put it to you in plain English. A PE ratio of 1,285 means you’ll have to wait nearly 1,285 years to make any money you invest in Shake Shack back at the company’s current earnings rate. To be fair, critics say that the PE ratio is a static measure. And, they’re right. It is. The PE ratio is a snapshot that freezes a company – in this case Shake Shack – at a specific moment in time. That’s why I also encourage you to take a look at the PEG Ratio. That’s the ratio of P/E to growth. As such, it’s a reflection of price as a function of expected earnings over a given time frame. Shake Shack’s PEG Ratio based on five years of projected earnings is 21.24. By comparison, the markets are regarded as having a PEG of 1. Anything less is a bargain. Anything more is expensive. The average fast food chain sports a PEG of 3.04 and Chipotle’s PEG is 1.68. So, if you’re buying SHAK stock, you’re implicitly agreeing that it’s worth a 598.68% premium to the rest of the industry given growth expectations. Then there’s the float – meaning shares freely traded. Shake Shack’s is razor-thin until the lock-up period expires in July. It’s worth noting that there are no options trading yet either. That means traders cannot effectively hedge their positions. So what you have is a recipe for higher prices that don’t necessarily reflect realistic valuations. With numbers like these, Shake Shack has no business in an investor’s portfolio. If you’re a nimble trader, have plenty of money to burn, and above-average risk management skills, then maybe it’s worth your time to dabble. But 99% of investors aren’t in that position. Whether it’s a bad earnings report that shatters the myth around the stock – and sends SHAK crashing down to more realistic valuations – or something like the Atkins Diet, Shake Shack will come back down to earth. And that brings me to another point – in fact, THE point. Like Krispy Kreme, SHAK’s stock has been sent into the stratosphere – however temporarily – by breathless reports from Wall Street and a hungry market fascinated by company products that are novel and even delicious. But it’s not enough for a company to be flashy, novel, and even impressively innovative in its sector. For it to be a “Buy” opportunity worthy of the Total Wealth community, it has to be tied into at least one of the six Trends. Anything else carries unnecessary and unjustified risk. A lot of people, however, might say that a company selling food is automatically tapped into the Demographics Trend. After all, the human population on Earth is set to soar in the coming decades, providing guaranteed growth in demand. But keep in mind that fast food is a consumer discretionary item, meaning that it’s something people can and will make do without in troubled economic times. It’s not a “must-have” because, quite simply, no one needs to have it. They only want it – and reliably indulge in it only in good economic times. There are plenty of food chains that are much more reliable plays to tap the Demographics Trend – and as I monitor them carefully, the Total Wealth Family will be the first to know. In the meantime, we’ll focus on the Unstoppable Trends for profits that beat the markets and stand the test of time. After all, companies that channel them successfully can’t be stopped by anything – be it Fed meddling, war, disease, global financial meltdown, and yes, even the Atkins Diet. You may be right, but this all about timing. You and many others may be carried out trying to get in front of this one. Wait for the mkt to tell you when the time is right. blind shorting is not a recipe for success. Great comment kb. Although it’s difficult to time that market it would be foolish to short without watching for the right price action. As we have seen at the end of the week prices are still going higher so anyone that is already shorting will be feeling very nervous right now. Both of you are, of course, right…but who said anything about shorting? 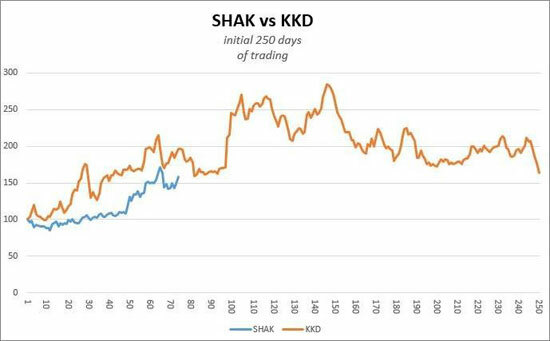 There are many ways to play SHAK depending on your personal risk tolerance and expectations…not one of which makes it a great investment. Trading opportunity, yes. But investment, no. Thanks to everybody for the kind words and thoughts! Don’t think I’ve ever eaten a socially conscious burger? You’re right Kieth! At the end of the day, Shake Shack makes burgers! History of Manias is as old as the History of Mankind. Would you believe, I have never heard of much less seen one. Very well written and expressed, as always. Please let me know when you believe the burgers are “ripe” for shorting and I shall strongly consider it. The current price is completely CRAZY!! Those idiots will regret when it drops back to $22 a share…clowns. Thank you Keith for the break down and explaining and educating investors like me who are still in the learning stage, while investing. I did buy SHAK at 57 and sold at 67, and very uneasy to hold that stock just like Gopro how ever I did make money on both of them. I tried the Shake SHAK burger before I got the stock and then of coarse listening to Jim Cramer this being another chipotle and tesla of burgers. After reading your views and getting more clarity I am staying away from this stock. Thanks for the kind words. No doubt there’s a contrarian opportunity emerging here. But, liquidity is limited until the lock up period ends so caution is merited. You may be early to the trade at a time when both sides are not adequately reflected in pricing. DID I BUY YOUR TOTAL WEALTH SUBSCRIPTION? I LIKE WHAT YOU SAY. I AM NO A BIG INVESTOR. I AM 89 YEARS OLD, A WIDOW AND JUST HAVE $20,000 IN THE MARKET. I LIKE YOUR ARTICLES. THEY ARE INFORMATIVE AND HONEST. THAT IS THE REASON I HAVE YOU ON MY EMAIL LIST. I WILL KEEP READING YOUR STUFF. IT IS VERY INFORMATIVE TO ME. Do we really need another “premium” hamburger joint? In CA, Carl’s Jr. has a grass-fed beef, no hormones or preservatives burger, and other restaurants are catching on fast to the “healthier” beef options. I don’t see much excitement over yet another such restaurant. Besides — we have In-and-Out Burgers and Rubio’s Fish Tacos — much better than anything else. Hi keith, you call shake shake shak a bad investment. My question to you: do you buy bad investments? Do you keep bad investments ? Or do you sell buy investments ? You write a roman about how bad is shake shak and i call shake shak shake the shorts… if you have a plan then you should inform investors about what to do, where to enter the market, on the long sidebor the short side, according a methodology…romans do not help to make money… decisions do…so keith what do you decide ? I just read your article and completely agree with you at $90 but I wanted to know what you thought of shake shake at $35 and the latest results.